114 (VF-114), home based at NAS Miramar, and deployed to Southeast Asia for combat over Vietnam. After a tour with VF-213, also at Miramar, it was reassigned to Marine Fighter Attack Training Squadron 101 (VMFAT-101) at MCAS Yuma where it was used in the training of crews for the Fleet Marine Force squadrons. In 1980, it was transferred to MCAS Kaneohe Bay Hawaii and served with Marine Fighter Attack Squadron 235 (VMFA-235) and VMFA-232. In November of 1983 it was reworked into an F-4S. It was stricken from the inventory in 1986, and transferred to the Museum. It has been restored in the markings of VMFA-134. This aircraft is on loan from the National Museum of the Marine Corps. Mission: Support the Marine Air-Ground Task Force commander by destroying surface targets and enemy aircraft, day or night under all weather conditions during expeditionary, joint or combined operations. 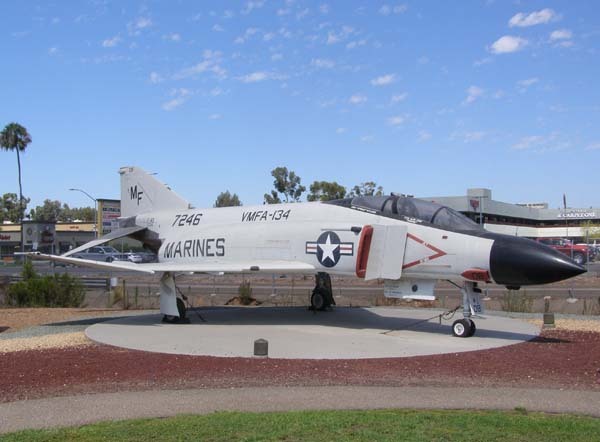 Model Notes:The Marine Corps received its first Phantom II, the F-4B, in June 1962. 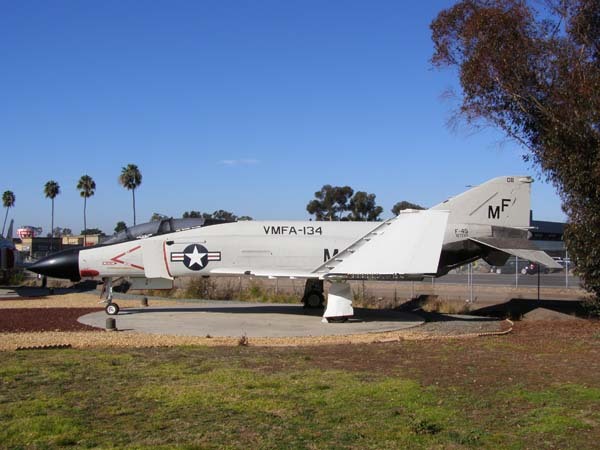 The F-4J was the final version of the Phantom II produced for the Navy and Marine Corps. It was an improved version of the F-4B and flew operationally for the first time in 1966. This version of the Phantom was constructed between 1966 and 1972. Because of increased weight and thus more demanding sink rates, the F-4J was fitted with sturdier landing gear which required modifications to the inner wings. In 1977 the F-4J was modernized to the F-4S standard with smokeless engines, extra structural reinforcement, and leading-edge slats for improved maneuverability. These modifications reduced required aircraft maintenance by 25 percent. F-4J(S) Service in the United States Marine Corps– The F-4J served in fighter-attack squadrons in both active and reserve Marine Corps units throughout the 1960s into the early 1990s. In the early 1980s, these squadrons began to transition to the F/A-18 Hornet, starting with the same squadron that introduced the F-4 to the Marine Corps, VMFA-314 at MCAS El Toro, California. On 18 January 1992, the last Marine Corps Phantom, an F-4S in the Marine Corps Reserve, was retired by the &quot;Cowboys&quot; of VMFA-112, after which the squadron was re-equipped with F/A-18A Hornets.